You can now stabilize 360 videos easily and effectively with Cyberlink Powerdirector 16 Ultra or Mistika VR. 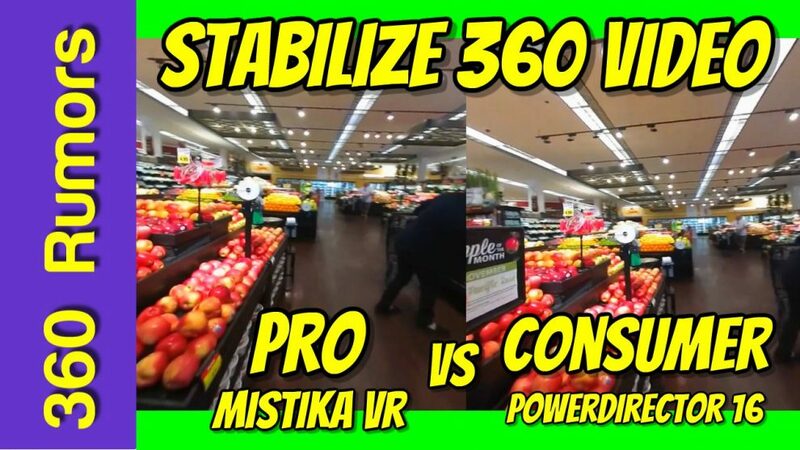 Powerdirector 16 is a consumer-level software for 2D 360 videos, while Mistika VR is a pro-level software that works on both 2D or 3D 360 videos. Both are easy to use and I’ll show you how. I will also show you how they compare to each other and against a 360 camera with gyro stabilization. 360 videos need to be stabilized to ensure viewer comfort. Some 360 cameras have a built-in gyro to level the horizon automatically. However there are still many 360 cameras that don’t have stabilization and sometimes the built-in stabilization is not good enough. For those situations, you can use a gimbal such as the Guru 360. However, sometimes using a gimbal is not possible or practical such as when mounting the camera on a dog for example (but I’m getting ahead of myself). Another way to stabilize 360 videos is with software. However, until recently, 360 stabilization software have been expensive, hard to use, and very time consuming. Check out my After Effects stabilization tutorial. Fortunately, there are now better alternatives available. One is Cyberlink Powerdirector 16 Ultra, an affordable consumer 360 video editor that is also surprisingly effective. Another is Mistika VR, a professional optical flow stitching program that also has a stabilization function. I had a chance to work with one of its developers to help them do tests to improve the stabilization, and got to beta test the new front-facing algorithm. – Xiaomi Mijia Mi Sphere around $250 (Amazon or Gearbest). I just discovered another option: Blackmagic Design Fusion 9 now also has 360 VR stabilisation. It is not an editor but a compositor (think After Effects) that plays nicely (roundtrip) with their editor DaVinci Resolve. The 360 stabiliser is only in the Studio version ( $ 299,-) so I haven’t tried it yet. I’m thinking of moving fully to Resolve/Fusion combo so perhaps soon I’ll be able to test it. Pricewise it’s inbetween PowerDirector and the Mistika subscription I guess. Why didn’t you show how to do horizon leveling in Powerdirector 16? It took me ages to figure out in that program, but it can be done. For anyone who wants to level their horizon (and stabilize the footage), here’s how to do it. After adding the clip to your timeline, click on the clip in the timeline, then go to Tools->360 Start View Setting. This dialog is designed to let you set “north” on your clip (y-rotation), but it also allows you to fix x and z rotation, which fixes the pitch and roll of the clip. It doesn’t give you a standard view of the whole frame, so you have to change the x and z rotation, click OK, then view the clip output preview. Z-rotation will modify the skew at 1/4 and 3/4, and X-rotation will modify the skew at the far left/right (0/4 and 4/4; it’s the same position, since it wraps) and the middle (2/4). Keep going into the start view setting until the resulting preview looks like it has a level horizon. You can apply the stabilization before or after; the order of steps doesn’t matter. However, once you get your horizon leveled, don’t modify the y-rotation, or else you’ll have to redo the x and z axis rotations again to get it level. It isn’t nearly as intuitive as a standard 360 photo leveler, but it’s a much needed correction that this program actually has, even if it isn’t well advertised. Fixing the horizon makes your videos much more watchable, because without it, panning left and right makes the world feel tilted, ESPECIALLY if you’re viewing with a VR headset. For your information, RE:Lens by RE:Vision Effects does amongst other things 360 stabilization for a while now (works in AE, Nuke, FCP, Motion, Fusion Studio, Natron, Scratch, Silhouette FX,…). Worth noting that Cyberlink software is pc only, whereas Mistika VR is available for pc and mac. The Yi is not stabilized. It generates an IMU file that needs to be processed in their Windows only software – and the results are worse than the original most of the time. One thing about the Yi is that for the stabilization to work, you need to use certain settings. I’m still trying to figure out what those settings are. I know that if you use 4K, with better (instead of best) quality, it will work. I haven’t figured out which combination of settings in 5.7K will be stabilized.